Would you like to know more about your figure type? Thanks to our Figure Type Guide for men you’ll find out exactly which one of the three body types you are. It also includes some handy style suggestions to highlight your best sides and conceal any problem areas. With an H-figure, your shoulders and hips should be approximately the same width. 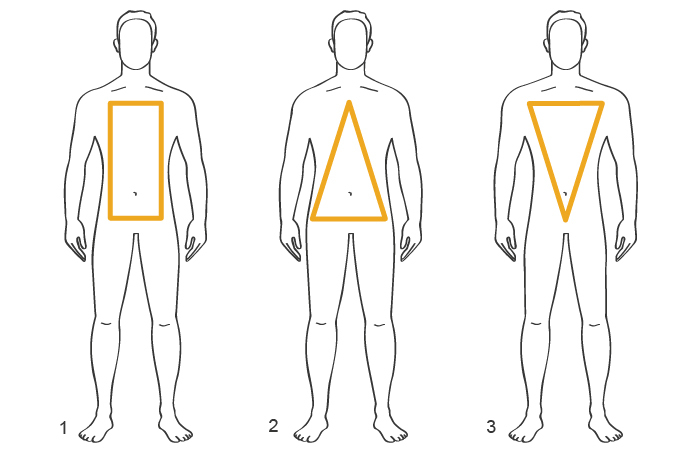 Your waist is relatively straight, with no pronounced or significant curvature. Arms and legs are rather long and slender and your physique resembles the prominent V-shape. With an A-figure, you have rather narrow shoulders, a wide hip area and broader thighs. The V-type is common among men and is characterized by broad shoulders and a defined chest. In comparison to the shoulders, the hips are relatively narrow.